Norwich City have signed Chelsea striker Patrick Bamford on loan until the end of the season. 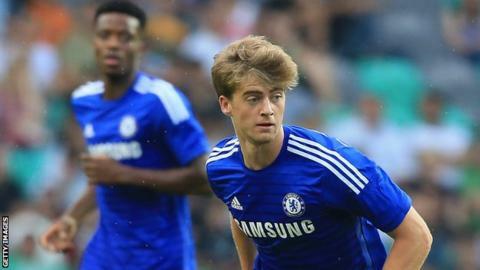 Bamford, 22, signed a new three-year deal at Chelsea in 2015 but spent the early part of this season on loan at Crystal Palace. But he did not score in nine outings, describing the spell as "disappointing" before returning to Chelsea. Bamford joins a Norwich side 17th in the Premier League and has not played for Chelsea since a £1.5m move in 2012. "I'm really happy to be here, and the sooner I'm able to get involved the better," Bamford told Norwich's official website. An impressive 2014-15 season on loan at Middlesbrough saw the England Under-21 international score 17 league goals in the Championship. "He's a young forward determined to make his way in the game, and adds competition for us at the top end of the pitch," Norwich boss Alex Neil told the club's official website. Bamford - who has also had loan spells at Derby and MK Dons - has yet to score a Premier League goal. He joins forward Steven Naismith, winger Matt Jarvis, defenders Ivo Pinto and Timm Klose, and midfielder Ben Godfrey to join the Canaries this month. Bamford leaves Chelsea 24 hours after the Blues signed Brazilian striker Alexandre Pato on loan from Corinthians.